A GREAT Britain yacht was launched today (Wednesday 31 July 2013) on the North Terrace of Trafalgar Square in front of the National Gallery. Nelson looked down from his column on the proceedings as Sports Minister the Rt Hon Hugh Robertson MP and legendary UK yachtsman Sir Robin Knox-Johnston named the GREAT Britain entry in the 2013-14 edition of the unique Clipper Round the World Yacht Race. GREAT Britain is one of twelve new identical third generation ocean racing yachts commissioned by UK based race organiser Clipper Ventures. The fleet will depart from Tower Bridge in London on 1 September 2013 on the world’s longest ocean race. The GREAT Britain yacht will spearhead an innovative trade and tourism partnership between the race organisers, the GREAT Britain Campaign and British based companies. GREAT Britain Team Partners from the private sector will engage with a comprehensive set of branding and activation opportunities supported by UK Trade & Investment (UKTI), Foreign and Commonwealth Office (FCO) and Visit Britain to demonstrate the UK as a place to visit and invest in. Alongside this will be an exceptional human adventure with crew of all ages and from all walks of life: ‘ordinary’ people doing something extraordinary. “This is a remarkable endeavour,” said Sports and Tourism Minister, the Rt Hon Hugh Robertson MP, who climbed aboard the 70 foot ocean racer to help officially name the GREAT Britain yacht. “It captures the great British spirit of adventure perfectly by opening up the opportunity of ocean racing to so many people. “The Clipper Race has played a leading role in promoting British sailing and is now a core asset for British business internationally; it is organisations like this that will continue to push our sporting prowess. “The GREAT Britain yacht brings together our sporting legacy with some of the strongest and most vibrant British brands in a unique global promotion that will reach out to international markets on six continents over the course of the next year. “I wish the crew and partners of GREAT Britain fair winds and great success in winning races, trade and tourism for the UK,” concluded the Minster. 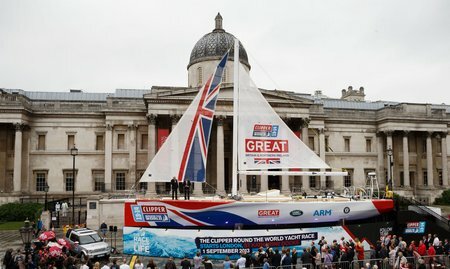 Sir Robin said: “I can’t think of a more fitting place to launch a GREAT Britain yacht than in Trafalgar Square. 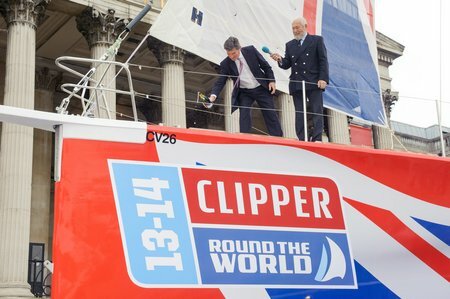 This is a unique project and I am very proud that the Clipper Race can provide a powerful platform to promote GREAT Britain to a global audience. We have helped to train over 3000 people how to sail and introduced scores of businesses and destinations to new opportunities as we follow in the spirit of the original Clipper ships which plied the trade winds to make Britain a great maritime trading nation. The project is bringing together a cross-section of partners from the private sector to sponsor the GREAT Britain yacht over the next 16 months and participate in an international campaign that will link up with UK trade and tourism global marketing initiatives. The first GREAT Britain Team Partners were revealed as iconic automotive brand Land Rover, the internationally successful hi tech company ARM Holdings and the leading independent London hotel group Grange Hotels. Team Partner ARM Holdings is the world’s leading semiconductor intellectual property (IP) supplier, and as such is at the heart of the development of digital electronic products. Over 20 billion ARM based chips have been shipped to date. London born professional skipper Simon Talbot (44) will lead an amateur crew that has been trained in preparation for the 40,000 miles race which will take 11 months to visit 15 ports on six continents over the eight leg series in a matched fleet of twelve 70 foot ocean racing yachts. He will take a break from training with his team to view their yacht in Trafalgar Square on Saturday 3 August at 10am. The GREAT Britain yacht will be in Trafalgar Square on the North Terrace in front of the National Gallery until Sunday evening 4 August where it can be viewed by the public daily from 8am to 10pm. It will sail back into the capital with the rest of the 12-strong Clipper Race fleet over the August Bank Holiday weekend to spend a week in St Katharine Docks, central London’s only marina, prior to departing from Tower Bridge on the Thames on Sunday 1 September on its 40,000 miles race around the world; the fleet will return to London almost 11 months later in July 2014.